Artists/Educators - Music Performance &Education, Inc.
Shelagh Abate is a celebrated horn player, educator and clinician in both New York and New England. Her warm, expressive playing and gregarious personality has helped earn her place among today's most sought-after brass artists. Well-established in the New York area as a Broadway performer, Shelagh is also an experienced chamber musician, and orchestral player. A founding member of the award winning Triton Brass Quintet (www.tritonbrass.org), principal horn of the Vermont Symphony Orchestra with Jaime Laredo, Shelagh is also a frequent artist on television programs such as America's Got Talent, A&E's Live! By Request, Good Morning America, the Today Show, as well as dozens of commercial jingles and commercial recordings. Elisabeth Axtell represents a generation of musicians whose careers are equal parts artistry and entrepreneurship. She is a co-founder and core member of Grand Harmonie, a groundbreaking ensemble bringing a fresh, spontaneous voice to period music performance on the East Coast. Recent performance engagements include Handel & Haydn Society, Boston Baroque, Boston Early Music Festival, Pacific MusicWorks, Bach Society Houston, Bach Vespers at Holy Trinity NYC, Blue Hill Bach Festival, and the Harvard Baroque Chamber Orchestra. A native of Washington State, Elisabeth holds dual degrees in English and music from Gustavus Adolphus College in Saint Peter, Minnesota and a masters degree in music performance from Boston University. Named a “one-woman dynamo” by The Boston Globe, Maria Finkelmeier is a percussionist, composer, educator, and arts entrepreneur based in Boston, Massachusetts. Maria is founder and director of Kadence Arts, a non-profit devoted to incubating artistic projects, curating performances, and engaging local communities through music making. Dedicated to shaping the next generation of performers and arts administrators, Maria is a lecturer at Northeastern University’s Music Industry Leadership program, and from 2012 - 2015 she served as the program manager of the Entrepreneurial Musicianship Department at New England Conservatory. Prior to rooting in New England, Maria spent three years in Northern Sweden at the Piteå Institution for Music and Media as an artist in residence. Maria has been commissioned to create works for TEDx Cambridge, ArtWeek Boston, and the Outside the Box Festival. As an orchestral percussionist, she has toured throughout Europe and Russia with the Baltic Sea Philharmonic under the baton of Kristjan Järvi. Horn player Anne Howarth has a passion for small group collaborations and the opportunities they offer to forge personal connections with the music, other musicians, audience members, and the wider world. She is a founding member and Outreach Director of the mixed-instrumentation chamber group Radius Ensemble and is a senior member of the wind quintet Vento Chiaro. Curious about the intersection between live music and movement, Anne has collaborated with Monkeyhouse and dancer/choreographer Karen Krolak at First Night Boston, the Oberon, and Tufts University. Anne plays principal horn with the Plymouth Philharmonic and the Lexington Symphony, teaches horn and coaches chamber music around Boston, and freelances. She holds degrees from Oberlin College, Oberlin Conservatory, and New England Conservatory. Accomplished composer arranger, and accompanist Mike Kregler was born in New York, New York. He earned both undergraduate and master's degrees at the University of Miami before beginning his wide-ranging career in music. As composer and arranger, Mike has been published by Walton and G|A for his choral compositions. His compositions span multiple genres including operetta, choral, solo piano, and chamber music. As accompanist and pianist, Mike has played extensively throughout the Northeast and currently serves as faculty accompanist and lecturer at Providence College. An artist of many styles, Kregler has developed the reputation for being equally adept in the fields of jazz, opera, choral music, art song, chamber music, musical theater, and popular music. After a successful audition in January 2017, Jose Martinez was granted tenure as the principal tuba player of the National Orchestra of Spain. The orchestra makes its home at the National Auditorium of Music in Madrid where it performs the majority of its concerts. In addition, the ensemble occasionally presents concerts all around Spain and abroad, including tours to Switzerland, Italy, Slovenia, and South Korea. He is thankful for the occasional guidance and support received from Alan Baer, Anne Jelle Visser, Chris Olka, Dennis Nulty, Don Lucas, Floyd Cooley, Ingemar Roos, Jimmy Olsson, Ramiro Tejero, Randy Hawes, Sergio Carolino, Toby Oft and credits a great deal of progress to summer studies at Tanglewood, Music Academy of the West and the University of Redlands. He will forever be indebted to Mike Roylance, Gene Pokorny, Morten Agerup and Sergio Finca, his greatest influences. During the years of full-time study in the USA, Jose was a member of the Civic Orchestra of Chicago and was fortunate to perform as guest with the Boston Symphony and Pops, Chicago Symphony, Minnesota Orchestra, New York Philharmonic, and the Saint Louis Symphony. Samuel Z. Solomon teaches percussion at The Boston Conservatory at Berklee, Boston University, is Percussion Director of The Boston University Tanglewood Institute (BUTI), and Artistic Director of the Juilliard Summer Percussion Seminar. From 2007-2011 he was president of the Massachusetts Chapter of the Percussive Arts Society. His book, “How to Write for Percussion,” has received critical acclaim from composers, performers, and conductors worldwide and is available in three languages. He has also authored three books on percussion playing and curated two collections of percussion etudes and solos. Solomon is founding member of the Yesaroun’ Duo and the Line C3 percussion group, from 2005-2010 he was percussionist-in-residence at Harvard University, and from 2003-2015 he was principal timpanist of the Amici New York chamber orchestra. He can be heard as soloist and chamber musician on GM, Albany, Bedroom Community, New Focus, and Tzadik labels, as well as performing the music of Björk on her soundtrack to Matthew Barney’s film “Drawing Restraint 9.” He lives in Scituate, Massachusetts with his wife, Kristy, and children, Nicolas, Leo, and Luciana. Please visit www.szsolomon.com for more. ​Founded in 2014, VirtuosoSoloists (full name: Virtuoso Soloists of New York) unites some of the finest young musicians in New York and Boston. Coming from diverse backgrounds each player brings his or her own personality, culture, life-experiences and musical flair to each performance. Bound together by a passion for musical exploration and excellence, VirtuosoSoloists attracts new audiences by crafting unique programs that highlight the connection between well-known classics and newly commissioned pieces. The innate versatility of VirtuosoSoloists allows the group to transform between small and large chamber groups, ranging from solo piano to string quintets and beyond. The fluid nature of the ensemble opens up a diverse range of repertoire, engaging the audience with a variety of timbres and a plethora of sounds. The VirtuosoSoloists experience conjures the feeling of an intimate 19th-century salon concert in a modern setting. Audience-members leave with a strong connection to both the music and the musicians. Saxophonist and conductor, Dr. Jennifer Bill has performed in Europe, Asia, and the United States. She performs solo and chamber music with a variety of groups including BRUSH|REED and Pharos Quartet. Dr. Bill is a Selmer Artist. As a conductor Dr. Bill currently leads the Boston University Concert Band. Dr. Bill is currently faculty at Boston University, Boston College, Pine Manor College, Rhode Island College, Stonehill College, and the Boston University Tanglewood Institute. Dr. Bill is also the sole organizer, director and officer of Music Performance &Education, Inc. Noted by the Boston Globe for her “intensely lyrical” singing, soprano Elissa Alvarez is an avid interpreter of recital, concert and operatic repertoire. Her diverse interests, spanning early to modern music, have allowed her to work closely with conductors, composers, and chamber ensembles alike. She is also is deeply devoted to the study and performance of Latin American art song. Dr. Alvarez is an Assistant Professor of Music at George Mason University. BRUSH|REED is a collaboration between artist and musician to explore the parallels of painting and sound through live performance. BRUSH|REED engages an audience through color, pitch, representational lines, rhythm, intensity and expression: an auralvisual experience. Justin Casinghino composes in a variety of genres, striving to create works that are lyrical, rich in harmony and possess a sound structural integrity. Also a performer in the jazz and popular idioms, this influence is often present in his music, but commonly at subtle levels. His studies of composition include work with, amongst others, Gunther Schuller, Lukas Foss, Theodore Antoniou and Richard Cornell. Casinghino has had pieces requested and performed by such groups as the Boston Symphony Orchestra Wind Quintet, ALEA III, the Longy Chamber Orchestra, the Rivers Symphony Orchestra, the Arneis String Quartet, the Lorelei Vocal Ensemble and the wind quintet Vento Chiaro, and was the featured composer on the Rivers School Conservatory’s 34thAnnual Seminar on Contemporary Music for the Young. His music has been featured in such venues as Tanglewood’s Seiji Ozawa Hall, NY’s Carnegie Hall and the Walt Disney Concert Hall in LA; and has been funded via grants through the Free For All Concert Fund and the New England Federation for the Arts. Dr. Casinghino is a lecturer in the departments of composition and theory at Massachusetts Institute of Technology and Boston University, and is the Associate Director of the Young Artists’ Composition Program at the Boston University Tanglewood Institute. The Fenway Quintet, Ensemble-In-Residence at Saint Peter's Episcopal Church, has been entertaining audiences throughout New England since its formation in 2006. In this time, the group has ﬁrmly established itself as one of the area's most esteemed professional brass quintets. Fenway's programming explores music both classical and adventurous, with a special emphasis on educational outreach for audiences of all ages. It is the quintet's mission to present challenging music at the highest level. Elizabeth holds a Bachelor of Arts degree in Music from Providence College and a Master of Music degree in Voice Pedagogy and Performance from Westminster Choir College in Princeton, New Jersey. Elizabeth teaches courses and holds the position of Coordinator of Vocal Studies within the Music Department at Providence College. She also teaches lessons at The Rhode Island Philharmonic School and maintains a private voice studio in Swansea, MA. With extensive experience in sacred music for over fifteen years, Elizabeth serves as cantor for parish and diocesan liturgies at the Cathedral of Saint Mary of the Assumption in Fall River, MA. She often sings as a freelance soprano at other churches throughout the Diocese of Fall River. Elizabeth is an experienced recitalist in the area of Providence and Southeastern Massachusetts. She enjoys performing a wide range of repertoire from Baroque to contemporary compositions. Yoshiko performs as recitalist, soloist, and chamber musician throughout Japan and the New England area. Recipient of several awards throughout Japan, Yoshiko was presented the opportunity, as a grand prizewinner, to perform her solo debut in the Tokyo Bunka-kaikan Hall. Her performances have been reported as "carefully colored and musically refined ... with a sensitive ear, relating sound to musical expression... Her remarkably unique interpretations were the charm of her performance..." Since her debut concert, she has returned to Japan by invitation to perform in various concert series. She has been invited to several summer festivals, including The New York Keyboard Festival and The Aspen Music Festival as a two-year fellowship. Yoshiko's performances have been broadcast live from the studios of Boston radio stations WGBH & WMNB and Aspen, CO Radio KAJX. 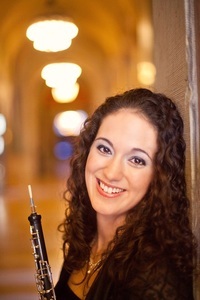 In addition to her classical interests, she excels as contemporary artist performing and premiering new works for resident composers and ensembles. Yoshiko received her BM at Toho-Gakuen Conservatory of Music and MM, with honors, at New England Conservatory of Music. Principal teachers have included Gabriel Chodos, Yoriko Takahashi and Tamiko Ishimoto. Her thoughts are all pictures, and she fills pages of sketchbooks with secret nonsense and meandering doodles, out of which evolve series of characters brimming with internal dialogue. Linnea paints them into pictures to nudge you to believe in her imagined reality where colors are twice as bright, love is infinitely more vivid, and the world is condensed into simple, crystallized pleasures, so just a smile ignites a connection to make any distance small. Trumpeter Josh McDonald has performed with many notable jazz greats, including Brian Blade, Conrad Herwig, Geoff Keezer, Kevin Mahogany, Christian McBride, John Patitucci, Danilo Perez, Ed Shaughnessy, Bobby Shew, Wayne Shorter, Anthony Wilson, and Gerald Wilson His playing and composing can be heard on several albums, including two releases in 2012: Breathe (Kev McDonald Fellowship) and Don’t Get Around Much Anymore (the Russ Wilcox Jazz Ensemble). Josh is the graduate assistant for the Boston University Jazz Ensembles (BU Jazz), and the director of the BU Jazz Wednesday Combo. He also conducts and composes for the BU Jazz Big Band. His playing and composing can be heard on several albums, including two releases in 2012: Breathe (Kev McDonald Fellowship) and Don’t Get Around Much Anymore (the Russ Wilcox Jazz Ensemble). When not performing or studying, Josh enjoys collaborating with the newly expanded SBS Fellowship, playing soccer, eating gluten-free muffins, and Walden Pond… the place, not the book. Based in Boston, The Pharos Quartet is a stirring musical collaborative encompassing four of New England’s most accomplished saxophonists. Emerging from their unique combination of ideas, styles, and expressions - Pharos brings the sound of the saxophone quartet to a new apex. From landmark compositions of centuries past, to the most recent works of this new century, their concerts are stimulating, entertaining, and unpredictable. Its members bring together their own international performance experience and fuse it into a distinct chamber music event. With a vivid repertoire, balanced between notable pioneers as well as visionaries of tomorrow, Pharos maintains a steady appetite for today's most demanding saxophone quartet literature. The Pharos Saxophone Quartet is available for concerts, master classes, residencies, and workshops. Award winning violinist Klaudia Szlachta has both performed and taught internationally. After earning her Doctorate of Musical Arts degree at Boston University with Professor Yuri Mazurkervich as her teacher, Ms. Szlachta was invited by the Institute and Festival of Contemporary Performance in New York to perform Luciano Berio’s Sequenza and Elliott Carter’s Triple Duo. Recently she returned to New York to give the World Premiere of “Six Minatures”, composed for her by Thomas Weaver. A Polish national, Ms. Szlachta has won numerous prizes and honors in Poland, including the First Prize and Grand Prix at the National Violin Competition in Elblag, as well as three special prizes for the best performance of the Brahms Violin Concerto. Ms. Szlachta also recently recorded music for a film entered in the Irish Film Institute’s Movie Festival. She has appeared in the prestigious Convergence Ensemble Chamber concert series, and in venues such as Carnegie Hall, The Kennedy Center and Boston’s Symphony Hall. She has collaborated on stage with Menahem Pressler and Joseph Silverstein, and has worked with the Tokyo and Vermeer String Quartets. Currently, Ms. Szlachta is a member of the New England String Quartet. She was asked to join the faculty of the BU School of Music in 2014, where she presently teaches. Thomas Weaver is an American pianist and composer currently based in Philadelphia. Weaver's playing has been hailed as displaying "sensitivity" and "deep resonance," as well as "incredible dexterity." He has performed extensively as a soloist and chamber musician, appearing in recitals both in the United States and abroad. He has been heard in concert halls in New York City, Boston, Chicago, Philadelphia, Nashville, Florida, Texas, New Hampshire, Tanglewood, Germany, and others. Weaver is an award-winning composer, whose works have been heard throughout the United States, Japan, Austria, and Germany. He has written for a variety of mediums, including solo, chamber, orchestral, vocal, and stage works. His musical language blends a love of Romantic timing and phrasing with a modernist harmonic and motivic language. Weaver is on faculty at the Curtis Institute of Music in Philadelphia. He is also a staff pianist and accompanist at the Boston University Tanglewood Institute and for Mannes College The New School for Music.